Honestly, we weren't planning on visiting Blue Water anytime soon. It's not that we don't like the place; in fact, we've been here before and it was a great experience. Rather, it's not the cheapest place to dine at and there is no way we'd bring the kids. My son won't eat a burger, let alone a whole lobster! Well, fate would have it that we'd end up here regardless. How did this happen? For starters, we purchased a Blue Water gift certificate for my parents as a Christmas gift. Then, Vandelay goes ahead and gives us one for our Christmas gift. So we decided that we should all go together rather than separately. Guy Smiley and Girl Smiley was kind enough to take care of the kiddies while we made our way into Yaletown. 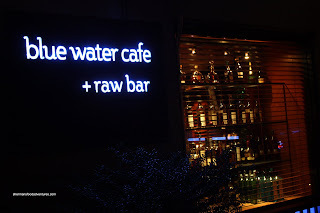 Blue Water is an interesting restaurant. On one side, you have a Japanese sushi bar and the other, there is your typical North American kitchen. Thus, you can dine on one or the other or a little bit of each. We chose the latter. Seeing how we had 4 people rather than just Viv and I alone, we went all out and got the Blue Water Seafood Tower. This 3-tiered monster has all of 1 whole lobster (normally a crab), Tuna Gomae, Seaweed Salad, Smoked Salmon, Mussels, Prawns, Spicy Tuna Roll, Oysters, Scallops, Real Crab California Roll and Red Tuna Tataki. At $138.00, this is no wimp of an appetizer. Frankly, it was actually a bit much for even 4 of us to share as an appetizer. Ah, what the heck, we didn't come to Blue Water for chicken strips! Technically, we were suppose to work our way up the tower; but everything looked so good, I just started digging into each plate randomly. 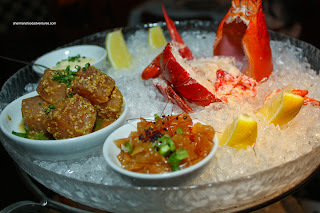 On the top plate, the lobster was cooked perfectly, soft enough to chew while the meat retained a slight resistance. A side of flavoured mayo served as a dip for the lobster (to my mom's delight, she loves mayo). 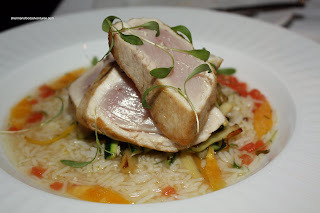 I thought the tuna gomae was excellent. Coated with toasted sesame seeds and a light shoyu dressing, the flavours were subtle and aromatic. The last item of the top tier was the Jellyfish salad. Resembling something you'd find in a Chinese appetizer platter, the jellyfish was crunchy with its distinctive "snap". Unlike the Chinese version, this was aggressively seasoned with soy, rice wine vinegar, sesame oil and sugar. There may have been sake in it as well (not sure though). Fresh mussels and prawn cocktail highlighted the middle tier. As expected, they were fresh and naturally sweet. The freshly made cocktail sauce was a nice compliment to the prawns. It was light tasting and not too strong (cheap cocktail sauce is like pure ketchup). In addition, there was a spicy tuna roll, oysters on the half-shell and a smoked salmon flower. Not much to say about the smoked salmon other than it was quite difficult to unwind. The oysters were fresh and sweet. The spicy tuna roll was somewhat of a disappointment. It was not really all that spicy and t he sushi rice was a bit mushy. However, it did taste good with the expected gentle hints of sugar and rice wine vinegar. 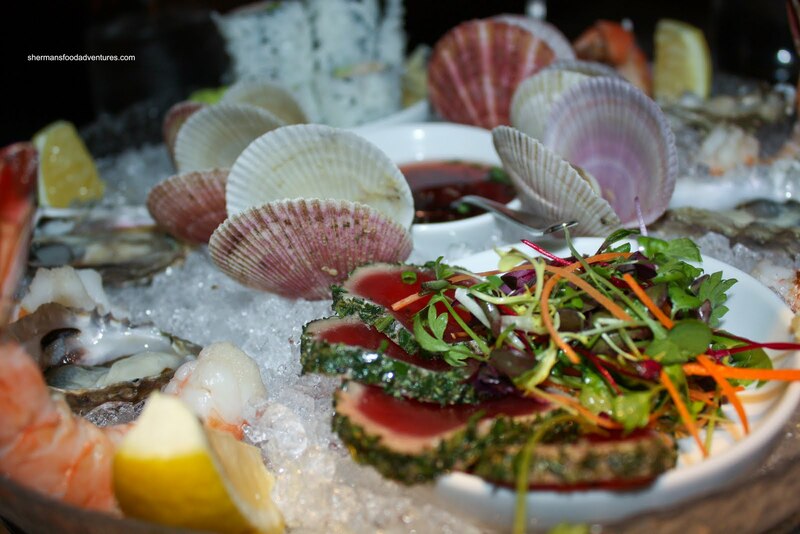 The bottom tier consisted of scallops, more prawn cocktail, more oysters, a real crab Cali roll and red tuna tataki. All but one of the scallops were fresh and sweet. One was barely open and it was not as fresh. We really enjoyed the tuna tataki. Not only did it look nice, it was sweet and was encrusted with herbs. I'm not sure if it is just me; but I find real crab rolls a bit bland. I guess by their very nature, the crab meat is not very flavourful, thus it gets lost when you dip it into soy and wasabi. After the "appetizer", we were actually a tad full. Despite this, we had already ordered an entree each. 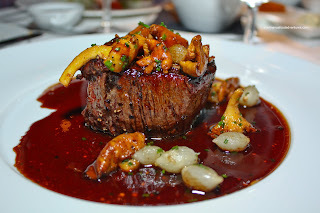 Departing from the seafood, my mom selected the Beef Tenderloin with golden chanterelles and red wine reduction. 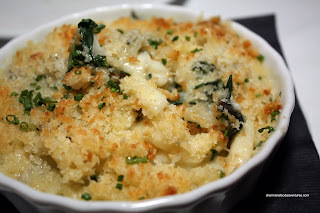 Served on the side was a green chard macaroni gratin with blue cheese. Despite being mainly a seafood restaurant, the beef tenderloin was cooked a perfect medium rare and melted like butter in my mouth. We did find that the red wine reduction was a bit too tart for our liking. Maybe with the addition of more butter would have helped temper the tartness. The side of macaroni was too salty. It had all the components of a good mac 'n cheese, especially with the chard (added a nice colour and textural balance); but the salt was just too overpowering. 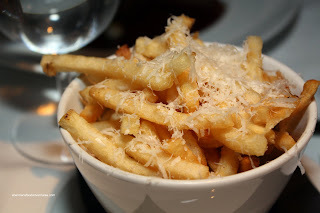 On the topic of overpowering, we also ordered a side of Pomme Frites with truffle oil and aged cheddar. Normally, I find that truffles and/or truffle oil are usually added as a accent to dishes. It generally gives a nice earthiness to a dish as either a balancing agent or something aromatic. However, in this case, there was a pronounced earthiness with the fries. There was no holding back with the truffle oil here. Add the cheese component and the fries were fantastic. Earthy and nutty, these crispy pomme frites are the real deal. If you do pay a visit to Blue Water, don't forget to add this to your meal. barely detected any flavour in the dish. Moreover, the whole dish was soft and mushy lacking in textures. Personally, I don't like rice submerged in liquid. It gives the rice a weird texture that is normally reserved for soup. 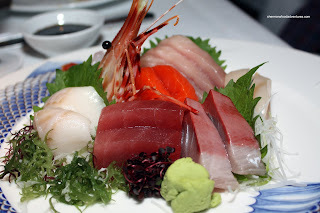 My dad wanted to eat healthy and he went for the Sashimi Platter which included wild salmon, hamachi, red tuna, tuna, sablefish, scallops and ebi. As you can see from the picture, everything was fresh (with that nice gloss, we call it "ling" in Chinese) and colourful. Well, it'd better be for $34.00! Of course, being a fine dining establishment, we didn't expect the slices of fish to be big and they weren't. This is definitely the case of quality over quantity. Being a bit full, we all decided to pass on dessert except for Viv. She chose the Okanagan Apples & Cranberries. It consisted of cake, cardamon ice cream and cranberry foam. Alright, unless I'm completely wrong, the cake did not resemble fondant as the described in the menu. Rather, it was a moist cake with nutmeg and cinnamon. It was topped with apples and a wonderful cardamon ice cream. 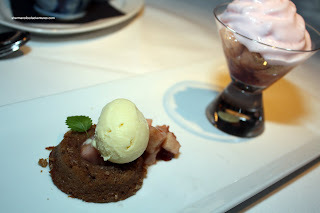 A good amount of sugar-sweetened apples were topped with a tart cranberry foam. A refreshing, if not ho-hum dessert. Overall, the meal was quite good, especially the seafood tower. That was a treat indeed. However, the entrees were not as spectacular. We all agreed that the tenderloin was executed quite well; but the tuna was disappointing. 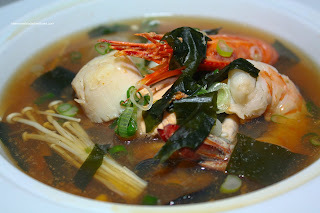 The seafood soup was good; yet again, it was nothing outstanding. Throughout our meal, we were never waiting for service, the service came to us, which is a good thing. 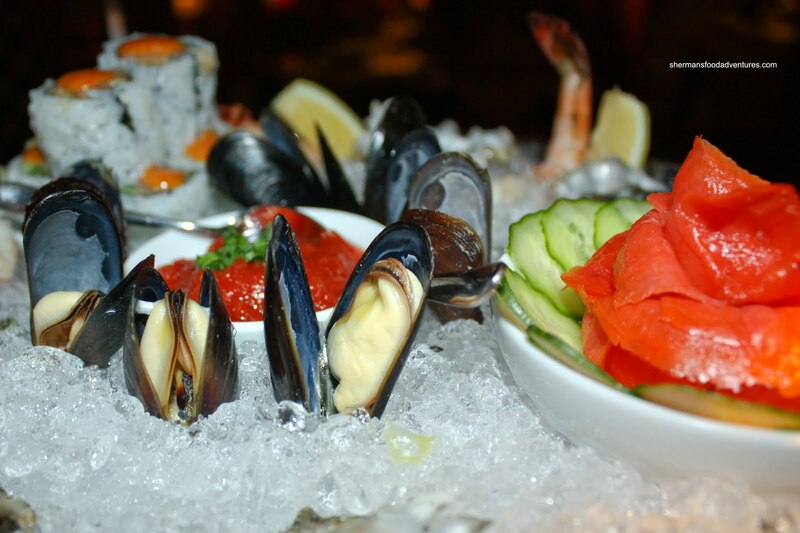 Generally, Blue Water is a good bet in Yaletown for seafood; you just need to be prepared to pay for it. 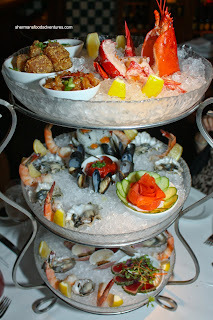 all i have to say about the seafood tower is... WOW. i've wanted to go to this places for ages but it's definitely out of my price range. however, if i was told i would die tomorrow, i would want to have the seafood tower as my last meal. more specifically, the tataki. what a beautiful colour! Man, that is a LOT of food! However, some of the choices seems strange considering the "raw bar" portion. I think I would have stuck with the standard Japanese fare, as it seems that deviating even slightly seems to be a recipe for disaster. Yes Kim, it was a lot of food. Well, the raw bar items "should" be good since the head chef is Yoshi (formerly of the restaurant he operated). Thus, I wasn't really concerned at the quality and execution. With that being said, we all know good quality sushi can be had for much less than we paid at Blue Water. That tower is a problem. If I went, I'd probably be full after the tower. But then, would it be appropriate etiquette to just order 1 appy for 4? What to do? Thanks for the kind words. I try to be as detailed as I am able. What hasn't been said about the tower Sherman, but YUM-O!!! Sounds like a great evening too, gotta love good food with the family. You're right Chris, it was nice to share with the family.